MISSION, KS--(Marketwire - March 7, 2011) - (Family Features) With the hustle and bustle of everyday, you shouldn't have to wait for a special occasion to have a party -- try turning the everyday into its own celebration and adopting an up-for-anything attitude. Planning a festive fête need not be a daunting task. Jennifer Sbranti, otherwise known as Hostess with the Mostess, is the queen of bringing creative party planning ideas to light. Sbranti shares some tips to make any day an occasion for entertaining without a lot of fuss. Her expert advice will help take your celebration to the next level. No matter how fancy or casual your occasion may be, choosing a theme will make the get-together more memorable and the planning process much easier. Themes can be as specific as you like -- perhaps inspired by a movie your group will be watching or a book you've just read -- or as simple as a favorite color palette, pattern or type of cuisine. Creating an atmosphere that's a little different from the norm is one of the easiest ways to transform any gathering into a special occasion. There's no need to spend a lot of time or money -- simple efforts like hanging colorful paper lanterns or creating DIY napkin rings and place cards from stylish papers will go a long way. 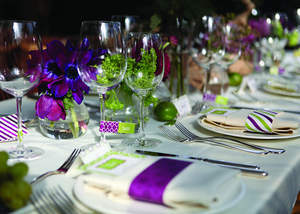 Use your theme as the inspiration for your party décor, and have fun with it. Let There Be (Mood) Light. When you're short on time or money for party decorations, white string lights and tea lights will always save the day (and night). Hang the lights around stair banisters, doorways, signature drink displays and anywhere else you can make them work, and use tea lights to dress up table and counter surfaces. Trust me, it will feel like a party. There's something about the combination of good friends and wine that just instantly feels like a party. Serve up a signature drink that is both creative and delicious for guests, such as Arbor Mist's unique blend of great tasting wine with a splash of fruit. For a festive presentation, add a simple fresh fruit garnish to the glass that complements each flavor of wine, such as colorful skewers of blackberries and kiwi for the Blackberry Merlot or playful fruit stars cut from pear slices for glasses of White Pear Pinot Grigio. See the additional flavors at www.ArborMist.com, and engage in fun conversation at www.Facebook.com/ArborMist. Whether it's a brunch the first Monday of every month or dinner and a chick flick the third Tuesday, try to develop a regular habit of getting together with friends. Having a standing monthly date to keep in mind makes it easier for everyone to coordinate their schedules around -- and it also gives everyone in the group an excuse to take turns playing hostess of the month.